Posted by M Bharath Bhushan in Adilabad, ecology. After barely a year in the reserve, the tigers — a male and a female — went missing. This is not the first time that tigers have gone missing from the erstwhile unified Adilabad district. HYDERABAD: For the second time in a decade, Kawal Tiger Reserve, one of the two such sanctuaries in Telangana, has gone “tigerless” with forest department officials having no clue about what happened to the two big cats that had migrated from the forests in Maharashtra in 2015. After barely a year in the reserve, the tigers — a male and a female — went missing around November last year. The two migrant tigers had raised hopes for the reserve which had last recorded the presence of big cats in 2012. There were, however, some unconfirmed reports of the presence of a tiger in 2013. A large portion of the 2,015 sq km Kawal Tiger Reserve falls in Adilabad, forest minister Jogu Ramanna’s Assembly constituency. 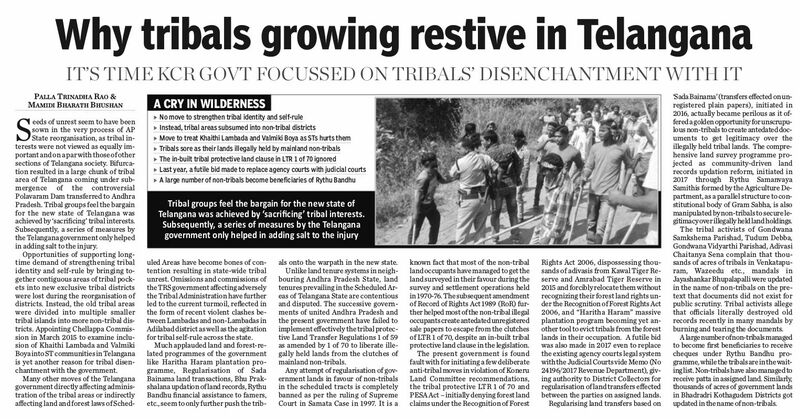 Despite this, several tracts of the forest have been encroached upon with the government not taking any steps to clear them, said sources. It is also reliably learnt that the reserve is one of the areas where people continue to lay electrified wire traps to kill wild animals. The reserve’s field director, C Saravanan, when asked about the missing tigers, said it was possible that the tigers returned to where they came from due to cattle and human disturbances. However, conservationists working in the area for the past many years were dismissive of the “tigers returned home” theory. “They are not like some species of birds that migrate every year. Tigers move in search of new territories.. they come into Telangana because of overcrowding in the tiger reserves in Maharashtra,” one of them said. This is not the first time that tigers have gone missing from the erstwhile unified Adilabad district. Since 1996, 18 tigers disappeared from the district, sources said. Posted by M Bharath Bhushan in Culture, ecology, Telangana, Telangana Festivals, Telugu (తెలుగు). హేవళంబి నామ సంవత్సర ఉగాది శుభాకాంక్షలు..
Posted by M Bharath Bhushan in Andhra, Bhadrachalam, BJP, Congress, displacement, ecology, Godavari, heritage, Koya, landuse, Polavaram, Settler, submergence, TDP, Telangana, TRS, violence. Project authority says Central water panel has no objection to approval. The ministry had issued the abeyance order earlier from June 30, 2015, for a year regarding the stop work order issued previously. 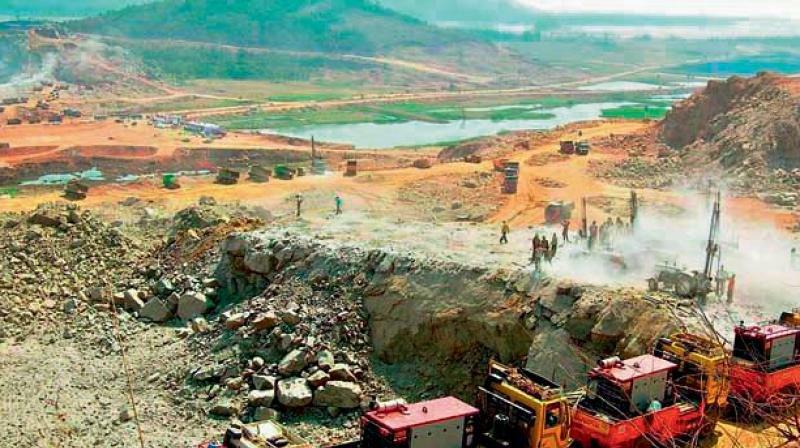 Hyderabad: The ministry of environment and forests’ (MoEF) orders regarding the Polavaram project — to keep the ‘stop the work order’ in abeyance — lapsed a week ago. The ministry had issued the abeyance order earlier from June 30, 2015, for a year regarding the stop work order issued previously. Posted by M Bharath Bhushan in Art, Culture, ecology, heritage, Telangana, Telangana Festivals, Telangana Places. Kolkata: Showcasing its rich culture and heritage, Telangana today offered a number of packages covering forts, palaces, wildlife, temples, eco-tourism and medical tourism to attract tourists from West Bengal. “Apart from high-end (income) visitors, people in West Bengal are also known for their inclination towards heritage and leisure. Bengal has thus emerged as an important market for tourism industry in the country and is now on our radar,” Managing Director of Telangana State Tourism Development Corporation (TSTDC) Christina Z Chongthu said here. At a roadshow on the occasion of Travel and Tourism Fair (TTF), Chongthu also looked forward to have tie-ups with tour operators in West Bengal for more tourists from Bengal to Telangana. Posted by M Bharath Bhushan in Art, Culture, ecology, heritage, Identity, Personalities, Telangana, Telangana People, Telugu. The Padma Shri award has come as a late recognition to K Laxma Goud, the versatile and prolific artist who introduced the cultural tradition and rustic life in Telangana to the world through his canvas. His paintings has an indigenous identity representing the Telangana way of life. His powerful drawings and skillfully rendered etchings have influenced many of his contemporaries. At the center of Laxma Goud’s practice lies the magic of making, an intense, passionate communion with tools, techniques and materials. Laxma Goud’s illustrious career has been marked with an all-encompassing diversity and high degree of craftsmanship both in medium and style. What made the prolific artist stand apart is his writhing, bleeding line. He has worked effortlessly in a wide array of mediums, such as painting, etching, pastels, gouache, sculpture (bronze, terracotta etc) and glass painting. He is known for his graceful, albeit highly powerful line drawings, watercolor works and etchings.